Dispenser STAR is a device which, in a simple and effective way for easy wrapping foil hand goods. 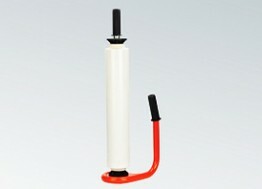 Suitable for rolls of a width of 500mm and 50mm diameter sleeve. The tool is distinguished by long life and resistance to damage, by being made of metal. The device created specifically for customers picking high quality.